Thoa Nguyen has a Vietnamese-accented downtown restaurant that bears her name (Thoa’s) and a Queen Anne sushi bar and pan-Asian cafe that’s long been her neighborhood stalwart (Chinoise). This week marks the debut of her latest venture, Wabi-Sabi, an 80-seat sushi bar and restaurant expected to open Wednesday in the heart of Columbia City. The name Wabi-Sabi, cutsie though it may sound, references a Japanese aesthetic — one said to find beauty in nature, simplicity and even imperfection. Exposed brick walls, cement floors painted to resemble sea colors, and benches and booths designed by Seattle artist Michael Fujii were built to look “very natural, very soothing, very Zen,” Thoa says. “I should have called it My Two Sons,” she laughs, explaining that Wabi-Sabi’s general manager is her 25-year-old son James Chong, whose younger brother, Jeffrey, will man the 10-seat sushi bar. “I’ve always encouraged them to get out of the business,” she says of her boys, who nonetheless are proud to keep a hand in the family business. Their Columbia City menu is decidedly Japanese — with an extensive list of sushi, sashimi and maki in addition to a wide variety of bento, donburi, ramen and udon — but you’ll also find Korean-accents (like mackerel and chirashi laved with spicy gochujang) and Hawaiian-styled rib-eye steak loco moco. Lunch and dinner will be served daily, with a late-night sushi happy-hour from 9 p.m. till midnight Fridays and Saturdays. There’s no bar nor cocktail lounge but drinks will be served, as well beer and a modestly priced wine list. The opening (and closing) of other Chinoise-branded restaurants in Wallingford and at Uwajimaya Village, and the recent sale of Chinoise on Madison to business-partner Jae Ahrens has Thoa looking toward the future with a well-honed entrepreneurial eye. 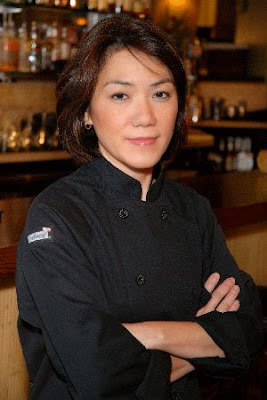 Despite the economic downturn, she insists, “it’s the perfect timing,” to open another sushi-centric restaurant — in a neighborhood that could use one. While the industry remains challenging, says Thoa, “If I waited for the economy to come back, it would have cost three times as much to build a new restaurant.” It’s cost her as much to open Wabi-Sabi, she says, as it did to open her original Chinoise, which made its Queen Anne debut in 1996.